More than 10 years ago I had the extreme good fortune to meet Susan Stewart at an industry event. To say in that moment I was star-struck is an understatement. I had been a huge fan of her column, “Sue Says” in Sew Beautiful Magazine for many years so meeting her in person was amazing to me! We talked, kept in touch after the event, and through the years have developed an enduring friendship I truly cherish. A little over a year ago she contacted me with a fun proposition. Her talented daughter who is a jewelry designer, had participated in a challenge with another jewelry designer. The premise was simple: each designer was to begin a piece of jewelry and then send it to the other person to finish. 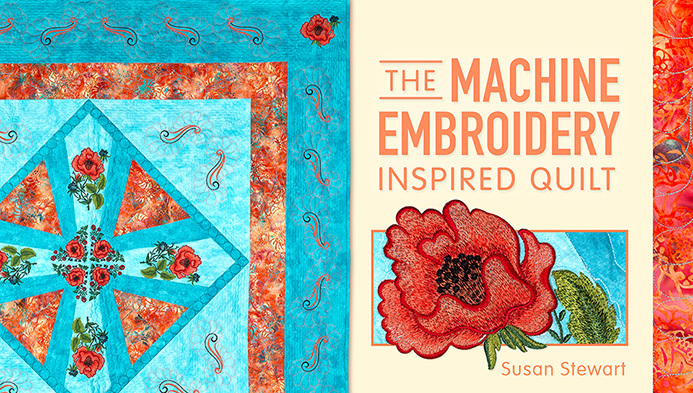 Sue thought this idea would translate beautifully for quilts so she asked me if I was interested. I jumped at the chance! We established a few simple ground rules. 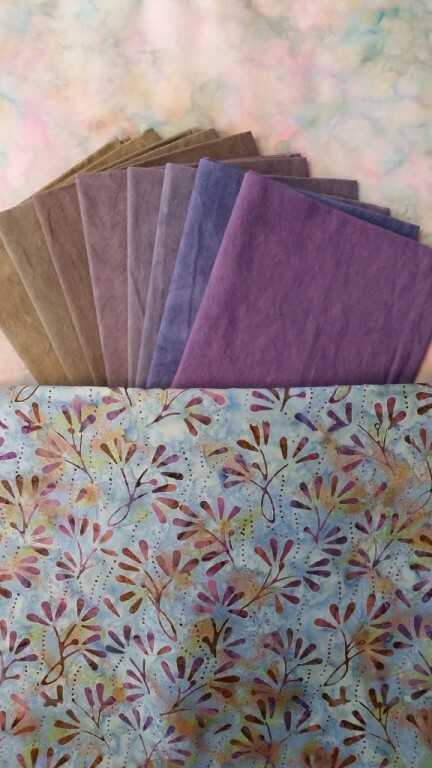 We would begin with a bundle of Cherrywood Fabrics (I chose the first colorway since I was at a show where they were vending) and we could each add up to two main fabrics and accent fabrics if necessary. 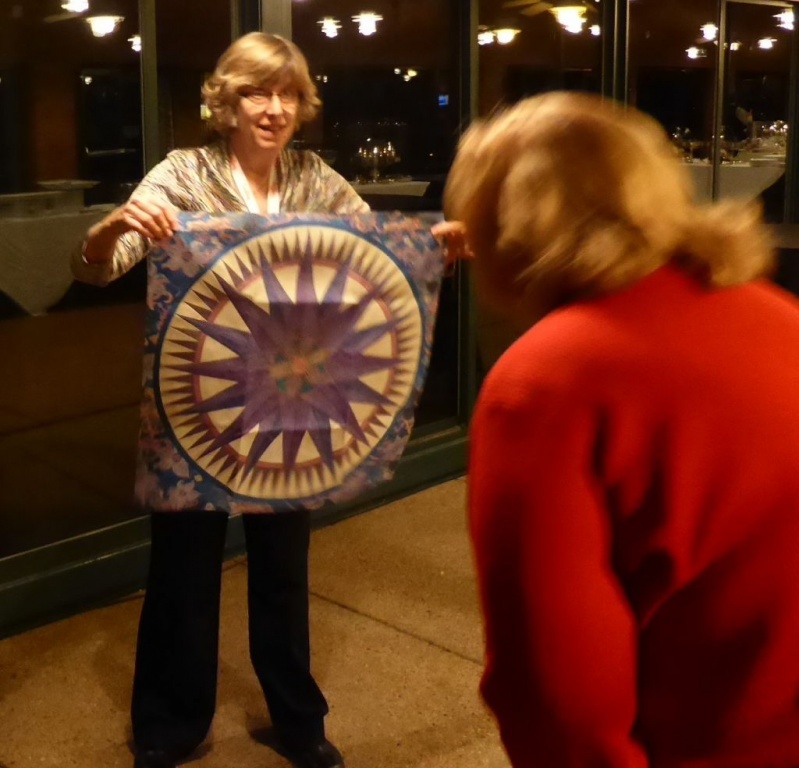 We’d each make four 16″ blocks and then send the blocks and remaining fabric to the other person to finish the quilt, which had to finish at 54″ square. Simple enough, right? 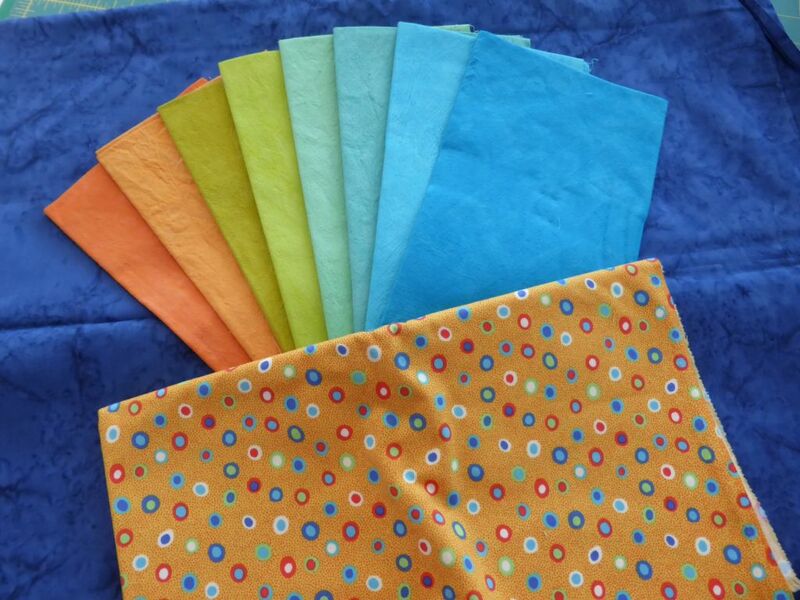 We both adore Cherrywood Fabrics and Sue was open to any color combination I selected. 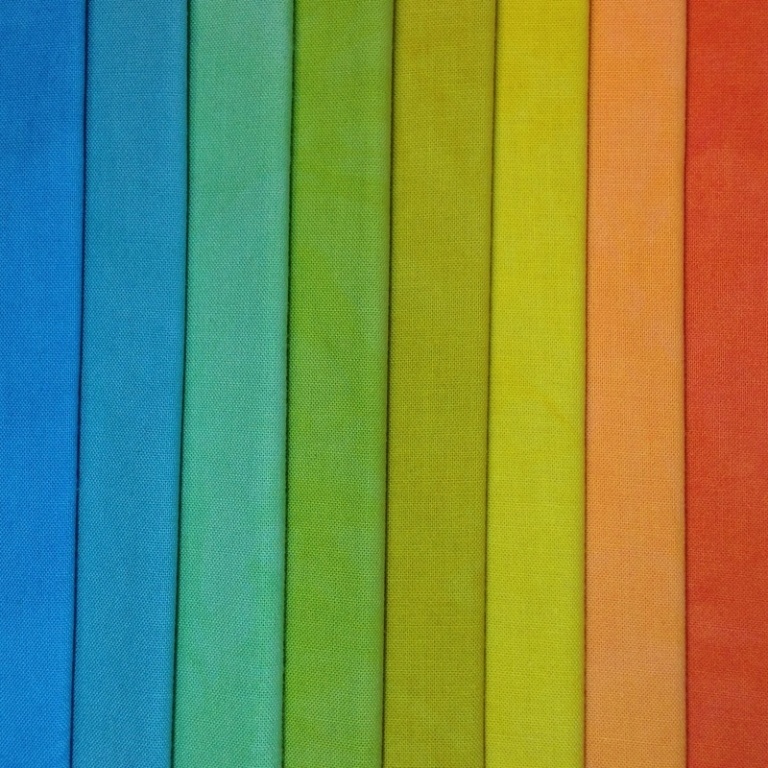 So I chose a bright group of luscious, citrusy fabrics called TROPICANA and I bought us each a bundle of 1/2 yard pieces. I added a royal blue batik for my background and found a funky, dotty print fabric which had been hiding in my stash and hadn’t seen the light of day for years. 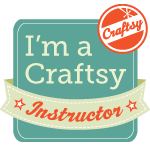 It seemed to fit the Cherrywood fabrics perfectly and added a bit of whimsy. Sue and I decided that any technique to construct our blocks was fair game so I thought I’d go a bit out of my box and try something different. At the time, I had just gotten my GO BIG! Accuquilt Cutter so I decided to cut some circles and Dresden blades, but change them up a bit to make them ‘funkier’ than a traditional Dresden plate. 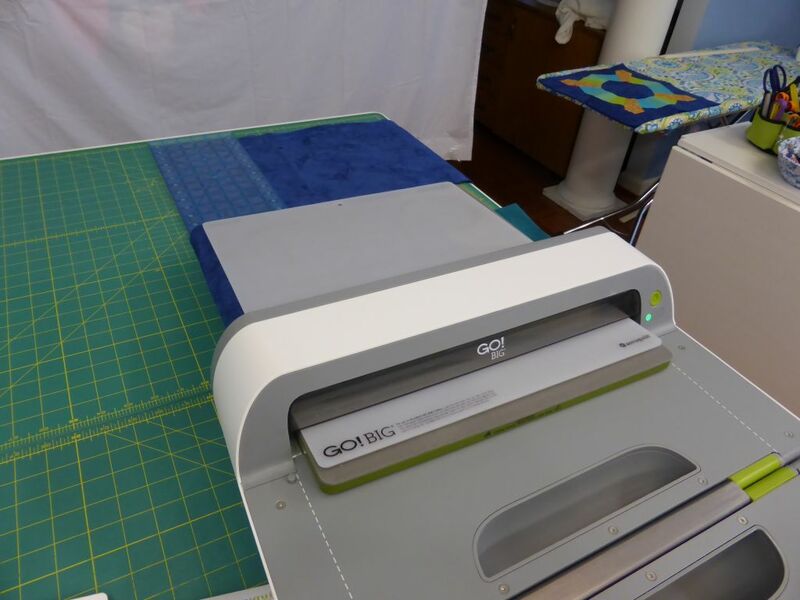 On a side note, if you have never used the Accuquilt GO! or the GO BIG! cutter, trust me when I tell you that you need to run to your local quilt shop and try them. 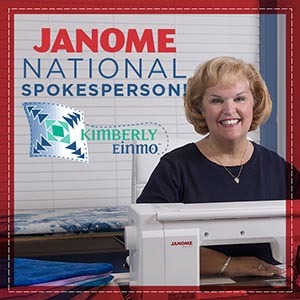 Wow, oh wow – they make cutting easy, accurate and a dream! Of course personally, I still love to use my trusty rotary cutter and ruler for many types of units for piecing but for odd shapes and applique pieces, you just can’t beat the GO! cutters. I simply love using them! Perfect circles in seconds. No kidding. I added a few accent pieces from my stash of Cherrywood fabrics and cut some Dresden pieces using the GO! dies. Honestly, I didn’t have a clear idea of what type of block I was going to end up with. I just cut fabric and began laying the pieces on my design wall. The colors just made me so happy! 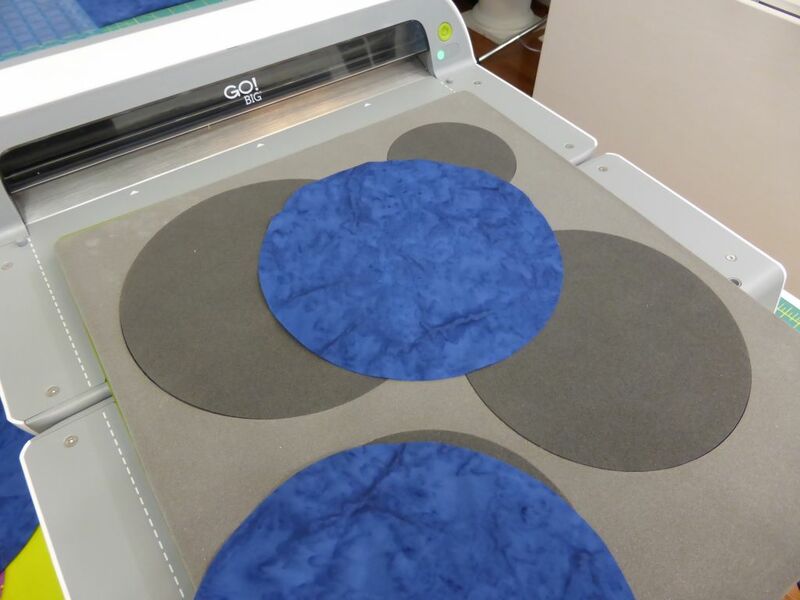 Before I knew it I had four 16″ blocks; each one a slightly different color variation, laid out and ready for machine applique. After I finished my four blocks I sent them to Sue with my leftover fabrics. I could hardly wait to see how she was going to finish it! 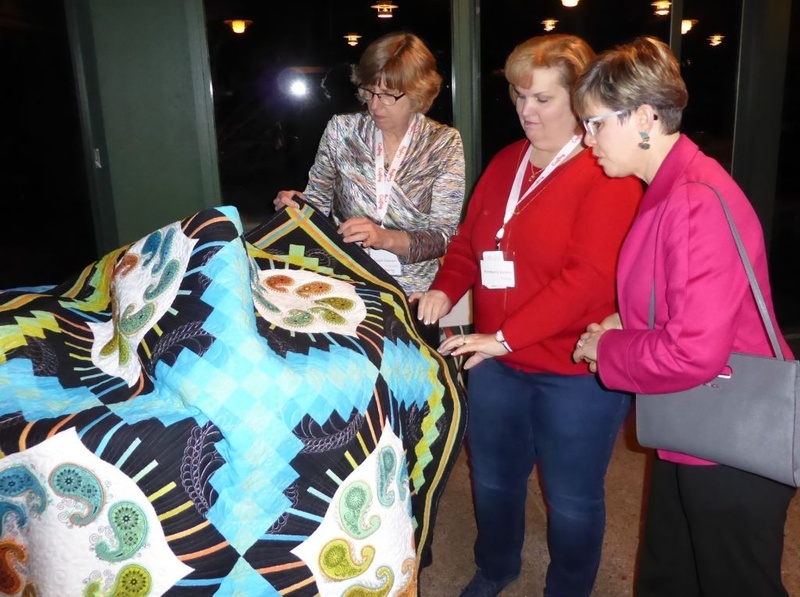 She completed her quilt rather quickly and we had the first “unveiling” event at AQS QuiltWeek in Paducah last year where I was teaching classes and she had won a major award for another one of her spectacular quilts. I was over-the-moon-excited to see what she had done and she did not disappoint. The quilt is STUNNING!!! 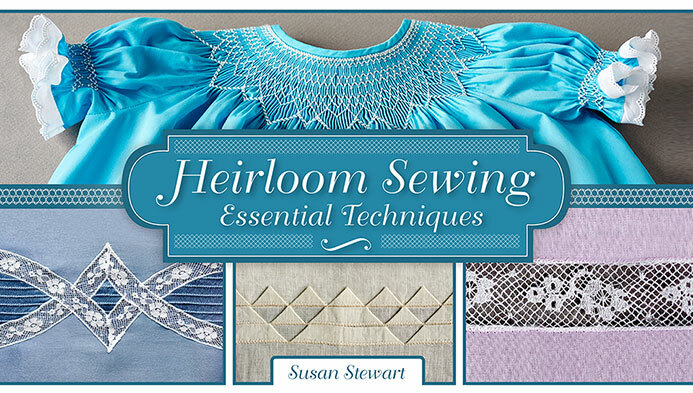 She added machine embroidery and 3-D machine embroidered lace flowers, gobs of perfectly pointed prairie points and so many extraordinary details, I simply couldn’t believe it! Isn’t it absolutely gorgeous? I just LOVE it!! 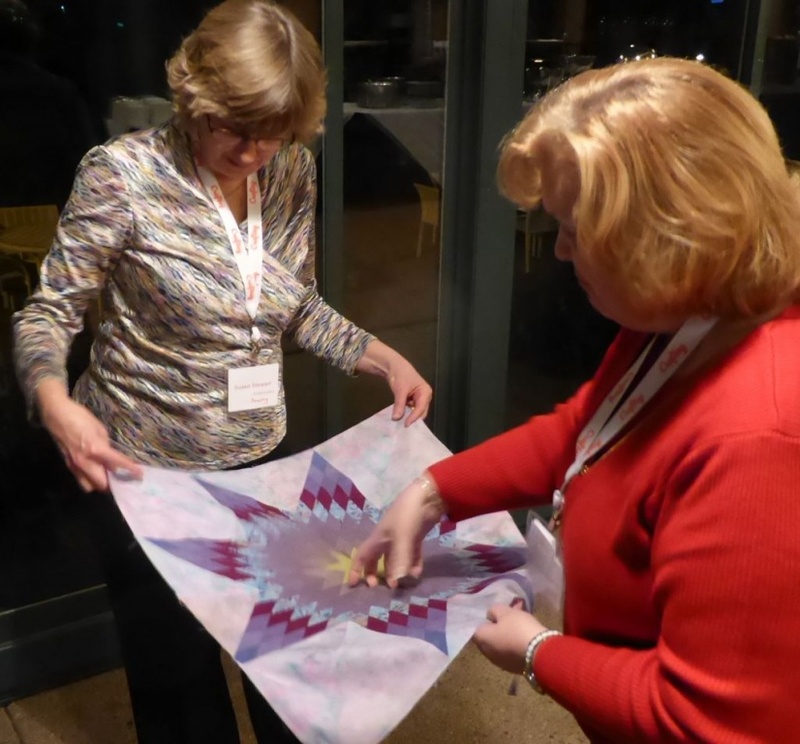 We were having so much fun we decided to continue doing these “Friendly Challenges” using Cherrywood Fabrics. 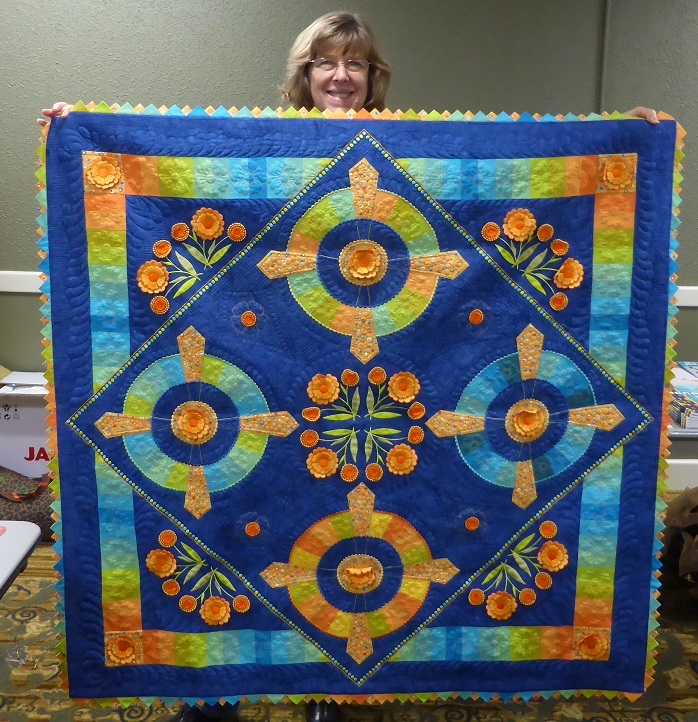 So last fall while she was at Quilt Festival in Houston (winning another major award for her stunning work, I might add….) Sue chose a completely different colorway and sent me a bundle of 1/2 yard pieces. She chose a very dusty, muted group of violets and taupes. I don’t mind sharing with you that these fabrics are proving to be quite a challenge indeed! 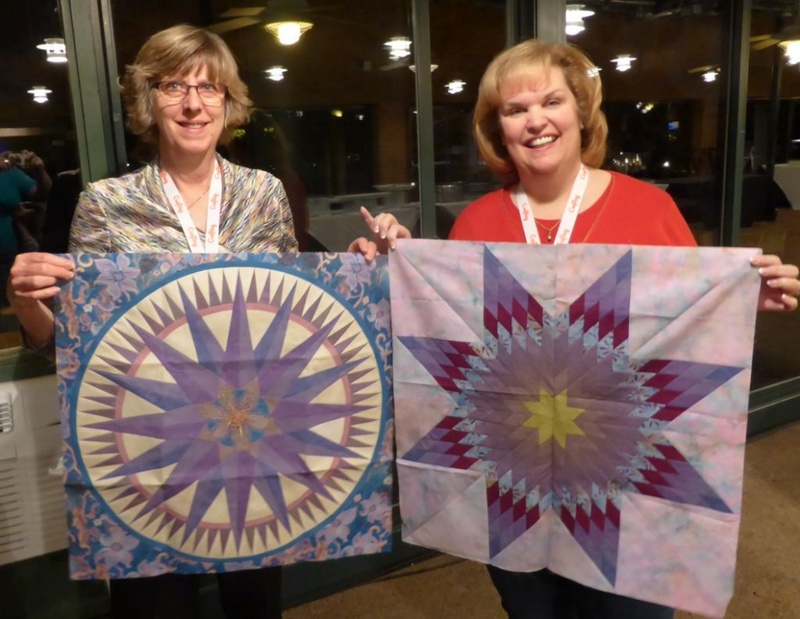 They are WAY outside of my “color comfort box.” We decided for this next challenge we would keep the same basic guidelines except we’d each make one 24″ medallion block instead of four 16″ blocks and then switch them to finish each others’ quilts to 54″ square. 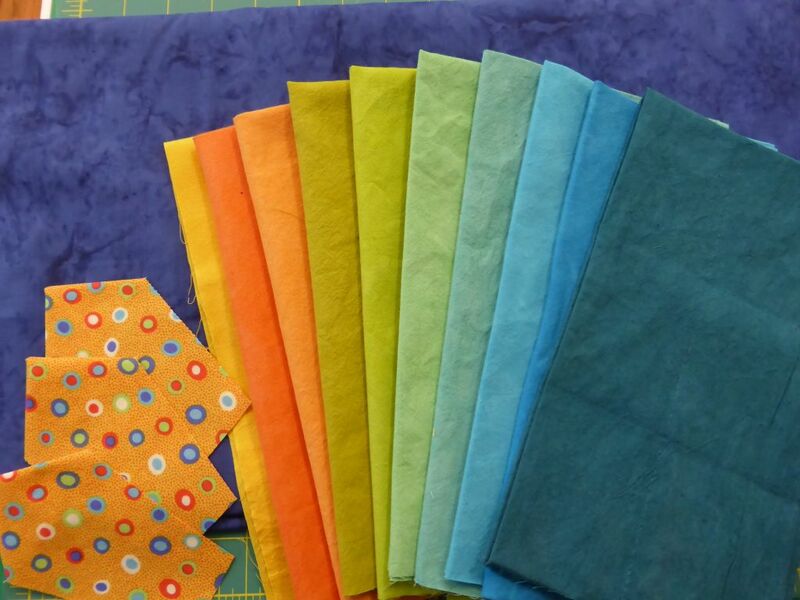 Below are the fabrics Sue chose for this next challenge. I added the background fabric and the multi-color batik, plus I ended up adding two accent colors — dark maroon and bright olive green, which are not shown in the photo. 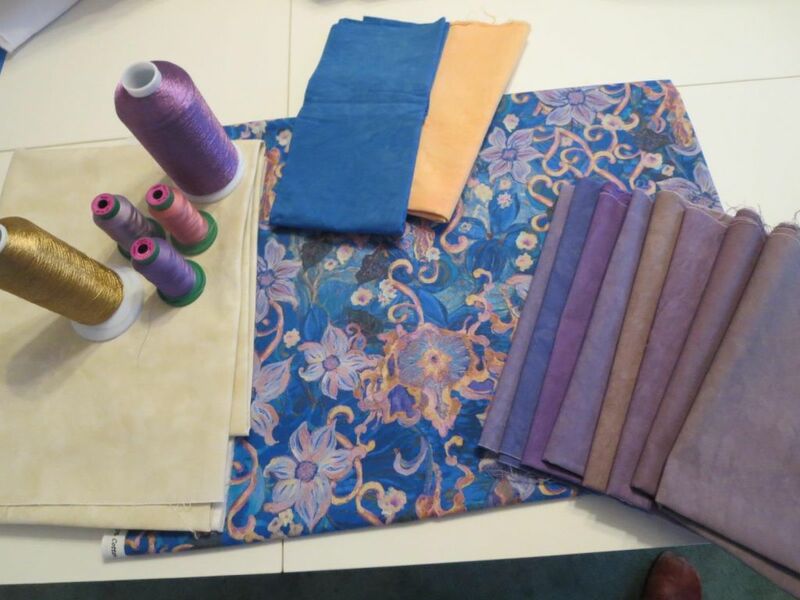 Sue sent me a “sneak peek” of her selections to coordinate with the fabric bundle. She added a blue and yellowy-gold, plus a light background and pretty floral print. 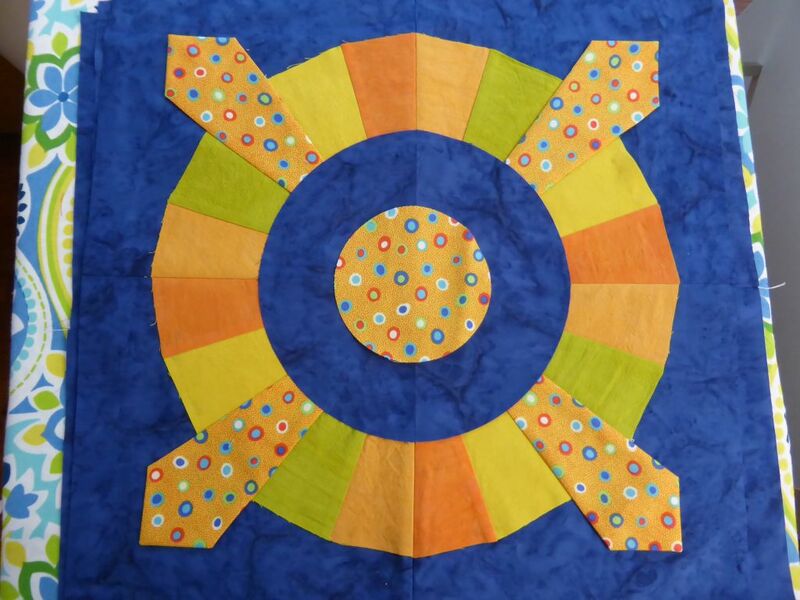 In the meantime, I had finally finished the first quilt with the blocks she had sent to me (with the help and talent of my friend, Birgit Schuller, who did lovely machine quilting). 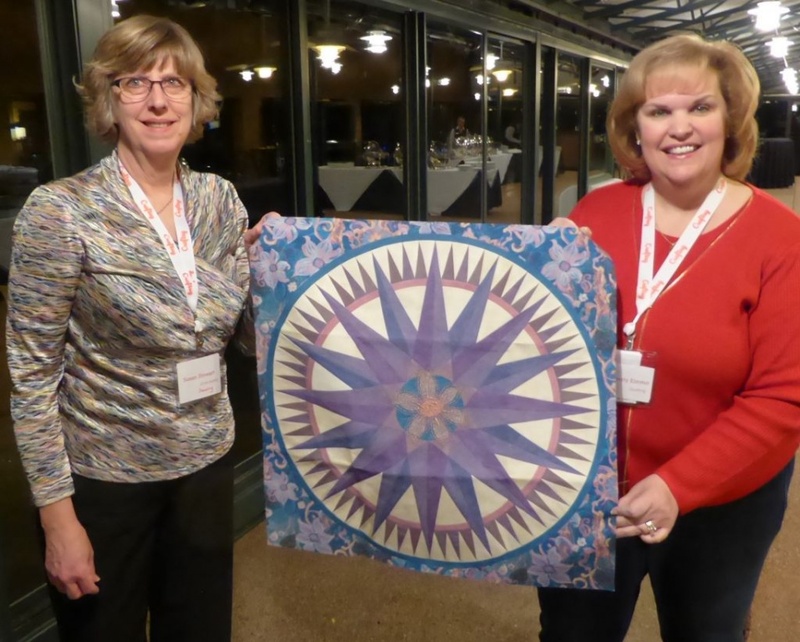 We planned the final big reveal of both first quilts at the CRAFTSY Instructors’ Summit which was held last weekend in Denver, CO. What fun it was to surprise her with the finished quilt, and our mutual dear friend, Susan Cleveland, was on hand at the event to witness the big reveal. I think both Sues loved it! Someday, over a cup of coffee or tea, I’ll tell you how long I worked on the borders alone! But I am very happy with the final result! 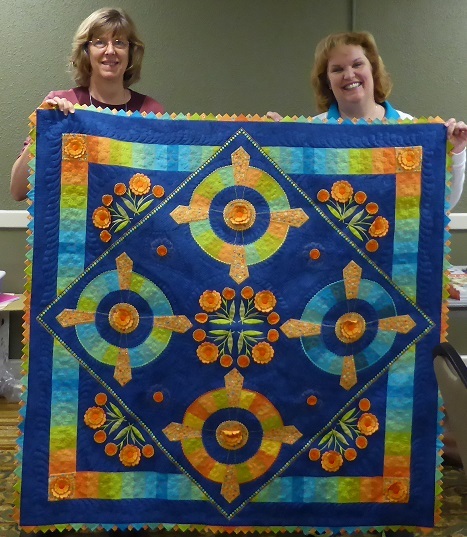 After spending time looking at both of the new, completed quilts, we unveiled the medallion blocks we made from the new fabric bundles. …..then my take of a traditional-style Lonestar. We’ve got our work (play) cut out for us to finish these beautiful blocks!!! I think what I love most is that I get to collaborate with such an amazing and talented friend. 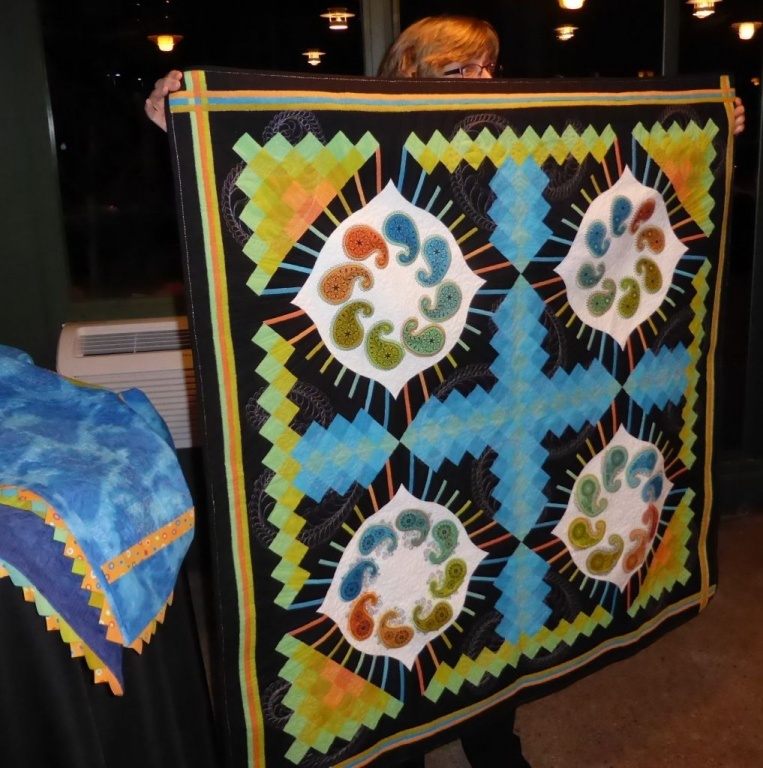 Plus, Sue challenges me to rise up and improve my skills with each and every step during the process of making these quilts. We have planned to turn these quilts into a special exhibit which I hope will be shown at some national shows in the future. We’re calling this our “Friendly Challenge.” Stay tuned……we’ll post more updates as we go along so you can see our progress as we tackle each step of the challenge! 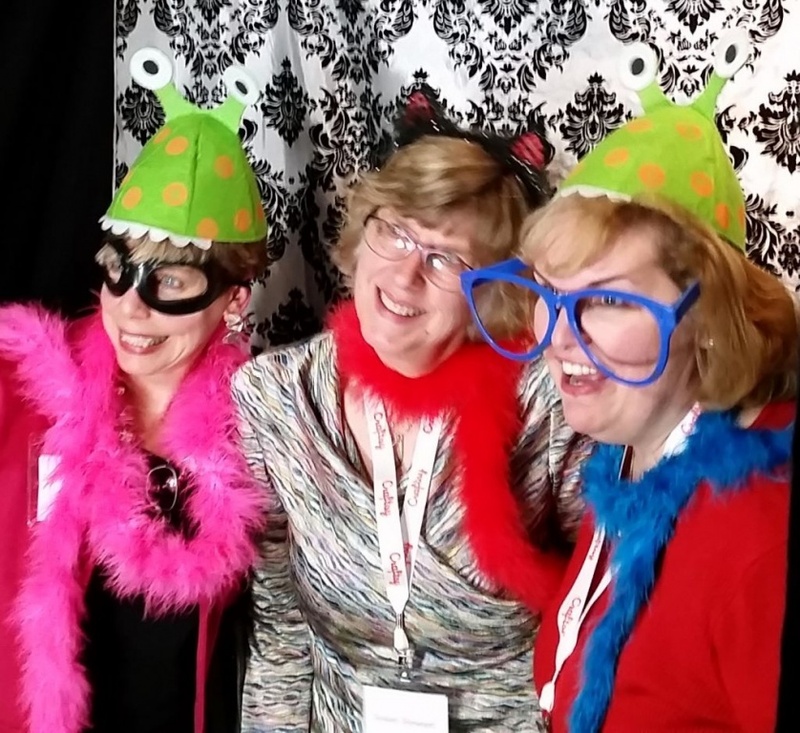 What a great blog about our delghtful ongoing challenge! I am enjoying this so much, and you perfectly captured the excitement of the big “reveal!” I will post my version of the event in a couple of days. Thank you, and mostly, thanks for your friendship! What a fun, wonderful thing to keep you connected with a special friend. 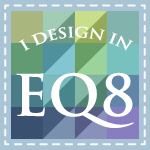 I look forward to seeing more of your projects! 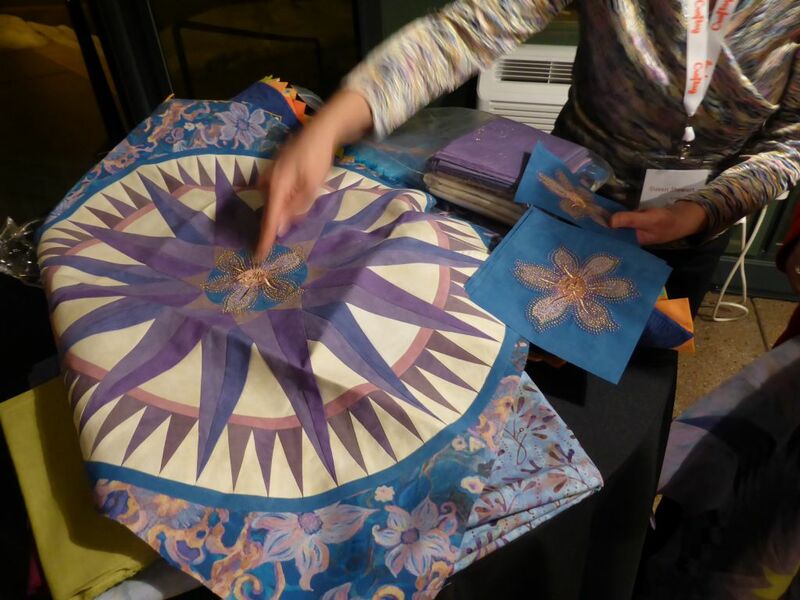 I am in awe at your precise piecing and love the collaboration that you have going. 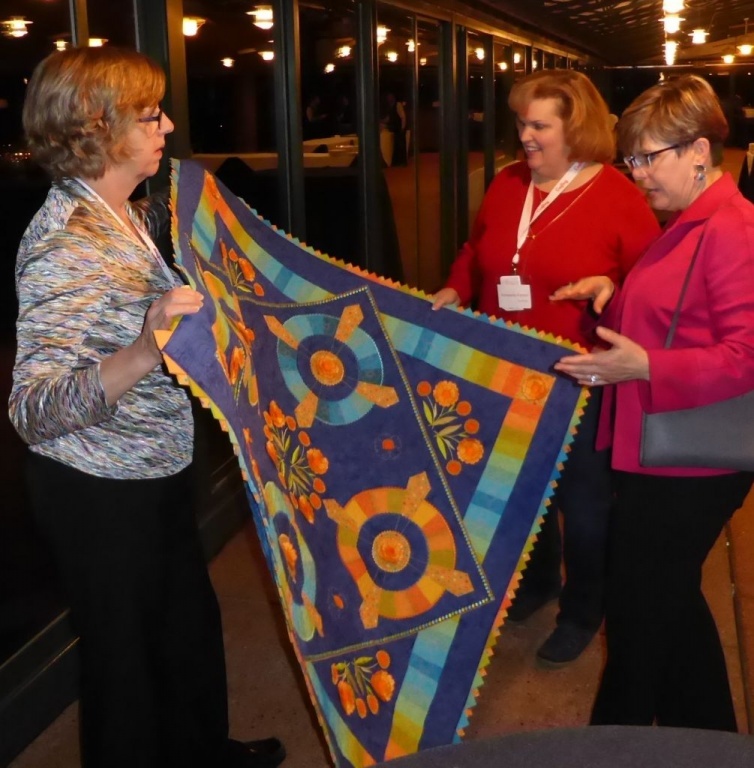 I’m heading to QuiltCon West next month and I think other quilters should collaborate this way. Wow, what a great idea and what fabulous results. 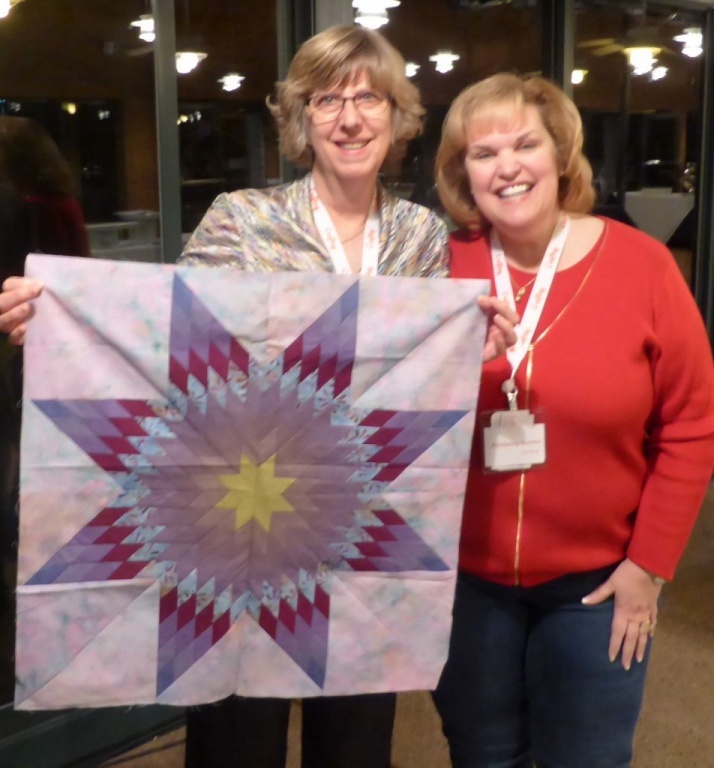 It is an inspiration to me to get quilting! Thanks for sharing the process and results. Man oh man I just could not believe how WOW and beyond WOW these are that are shown. It made my heart goes two beats each. Oh the brains that came up with all. My hat off to both of you. 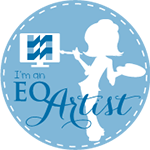 Ladies, you are fabulous quilters and an inspiration to those of us who are sometimes afraid to go outside our comfort zone. Absolutely beautiful work and I cannot wait to see the big reveal! I just purchased the Go! 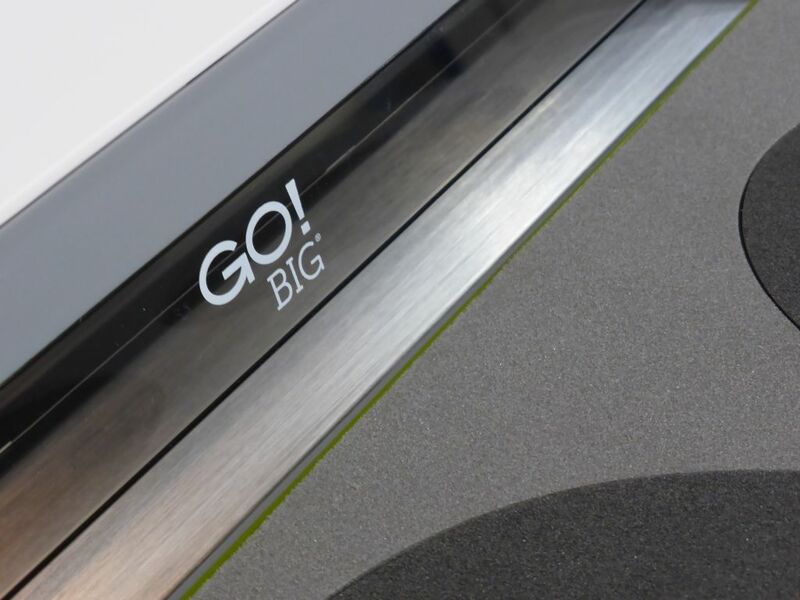 Big cutting system and this is very exciting. I cannot wait to see what you do next. Thank you also for the class offer! 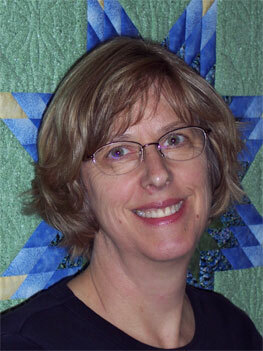 Have a wonderfully quilty day. Wow!! All of the quilts and blocks you shared are stunning. What a fun collaboration.